T- spends the summer at Bowdoin, then September in Alaska, fishing. Has, for many, many years. 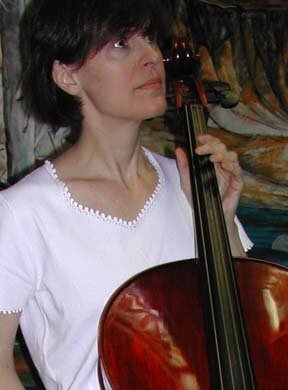 Last summer I filled the didactic void with 4 cello camps, an experiment in excess. Not entirely successful, but I learned a lot about what I like, and where I fit, and what's worth my time, effort, and money, and what's not. And how different all of those points are now than they were four years ago, when I took the more obsessive fork in the road toward cello playing excellence. This summer will be something completely different. I have no cello camps scheduled, partly by design after last year's excess, and partly because I knew I would need lots of recovery time after my knee surgery. I had toyed with the idea of starting Suzuki teaching training this summer, but am also putting that off, mostly because of the knee thing. He offered the possibility of one more lesson before he takes off, but I'm really ready for summer to start. I read a very interesting book on Monday, The Perfect Wrong Note: Learning to Trust Your Musical Self, by William Westney, and one point that resonated was how difficult a weekly lesson can be when you feel like you need to have something prepared for the lesson, but really should be doing the painstaking work of slowly exploring the music instead of rushing to get something ready. That's the way this second Bach Suite has felt to me all year. I am so looking forward to taking as much time as it takes to learn, and hopefully memorize, all six movements without having to bring anything that's not ready into daylight for the next four months. I told him that is my plan. He politely squelched his snort, and spent the last half of the lesson giving me an overview of the more difficult things to work out in the Menuets and Sarabande. I think the other four movements will yield to rhythms and other repetition games, but have been stumped by how to work out these two movements. My project for this afternoon will be a brain dump of those points, to retain as much as possible for later study. And that will be a post for later. School's out, and I'm finally ready to get to work. I'm psyched. An impressive schedule! I am sure you can do it. I've been meaning to read The Perfect Wrong Note (just love the title), so thanks for the mini-report on that. That sounds like a great book to put on my reading list as well. I hope your knee recovers well. Thanks so much for visiting my blog and leaving kind words. And good luck with Bach. I've done # 1 and 3 and just can't seem to wrap my head around #2! I'm confident I can do it too, Maricello. Sometimes <g>. At other times I question my sanity. Cellista, I understand completely. It's taken me several years to get ready for the second suite. I know I'm finally ready because I can hear the music. Before it was just mush.